World-famous American artist GEORGE CONDO, who painted Costanzo for the album cover, paints live on a giant canvas. CALVIN KLEIN will wardrobe Costanzo, along with the orchestra, dancers, and extras in costumes designed by the brand's Chief Creative Officer, RAF SIMONS. New York City Ballet choreographer and 2018 Tony award winner JUSTIN PECK creates new choreography danced by American Ballet Theater and Bolshoi Ballet star DAVID HALLBERG and Miami City Ballet star PATRICIA DELGADO. Chinese multi-media artist TENZHOU CHEN. Philadelphia's GLASS HANDEL will be played by the OPERA PHILADELPHIA ORCHESTRA conducted by music director CORRADO ROVARIS, and NYC will be played by THE KNIGHTS, conducted by ERIC JACOBSEN. On the album itself, Costanzo performs works of baroque master G. F. Handel and minimalist 20/21st century composer Philip Glass, all played by the orchestra LES VIOLONS DU ROY, who will join Anthony for a concert tour this fall as well. Conducted by music director JONATHAN COHEN, the orchestra has as much facility with minimalism as they do with baroque style. Anchored by Costanzo's alternatingly powerful and sweet sound, this album presents a unique juxtaposition which exemplifies his artistry. "Handel defined me. Glass changed me," writes the 36-year-old singer in the liner notes. In that sense, the album is autobiographical. Handel facilitated many of Costanzo's early successes: He won both the Metropolitan Opera's National Council Auditions in 2009 and Operalia 2012, with "Rompo i lacci" and "Stille amare" (the latter becoming his signature aria on the international competition circuit); played his first title role in Tolomeo at Glimmerglass in 2010; and made his Met debut in 2011 as Unulfo in Rodelinda. But 20th and 21st century works have provided both a ballast and a distinctive way forward in his career, since even the most famous opera houses may only program one Baroque opera each season. Costanzo has played a tin-pot dictator in the New York Philharmonic's staging of Ligeti's Le Grand Macabre in 2010; an aging and lovelorn Michelangelo in Suzanne Farrin's La Dolce Morte at the Metropolitan Museum of Art in 2016; and the inscrutable Boy in George Benjamin's modern masterpiece Written on Skin at Opera Philadelphia in 2018. It was the title role of the mystical pharaoh in Philip Glass's Akhnaten at English National Opera and Los Angeles Opera in 2016-an undertaking that inspired Costanzo to shave his head and adopt a monkish diet and workout regimen in preparation for the part-that provided a personal breakthrough for him as an artist. "In order for that show to have the kind of impact it can have, and for it to transcend in the way it can transcend, I had to reach a new level of artistic depth in myself," says Costanzo. "Once I had done that with Philip Glass, I could take that modality and apply it to the baroque music I had been singing for 10 or 15 or 20 years." 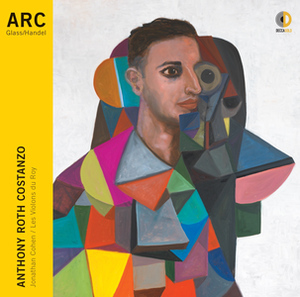 The result is ARC, a startlingly original work that weaves together the twin threads of Costanzo's artistic life, while putting familiar works in a novel context that allows the listener to hear them anew. The track sequence alternates between the two composers, stringing together arias, songs, and excerpts like gemstones on a chain. The Glass pieces on the album include "The Encounter" (1000 Airplanes on the Roof), originally performed by Linda Ronstadt; "Liquid Days," a curio originally written for the all-female folk band The Roches; and "Hymn to the Sun" (Akhnaten), which, with its bright rays of harmony and Costanzo's possessed performance, provides the album with its resplendent finale. The track is also a sign of things to come, since Costanzo is slated to star in Akhnaten when it comes to the Metropolitan Opera in 2019. In addition to lesser-known Handel repertoire that has marked the milestones in Costanzo's career, he includes two classics: "Ombra mai fu" (Serse) and "Lascia ch'io pianga" (Rinaldo). "I thought they were two interesting anchors for all of this weirdness," says Costanzo. "I have followed Anthony's career for a long time, and at every turn, his artistic genius blows me away," says GRAHAM PARKER, president of Universal Music Classics and Decca Gold. "When he signed to Decca Gold, it was a match made in heaven: we are the U.S. home of some of the leading classical artists of our time, and his bold and unapologetic approach to curating music and art makes him a standout in not only the classical world, but beyond."